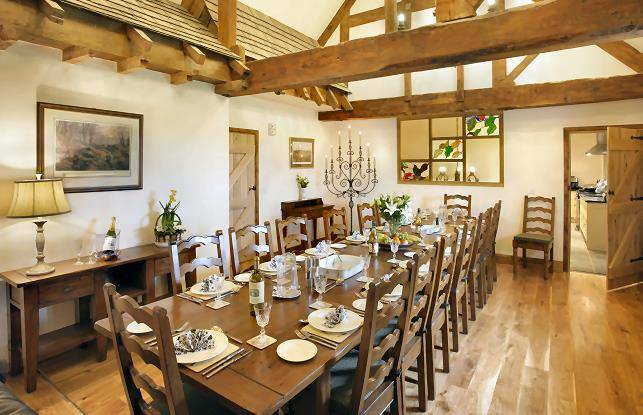 Trevase Granary is located five miles west of Ross-on-Wye in rural Herefordshire, close to the Wye Valley and the Malvern Hills. Penblaith Barn is just four miles north of Monmouth in South Herefordshire. They both enjoy excellent road links and are easily accessible from Bristol (40 miles), Cardiff (45 miles), Birmingham (66 miles), Oxford (74 miles) and London (128 miles). The nearest rail link is in Hereford. 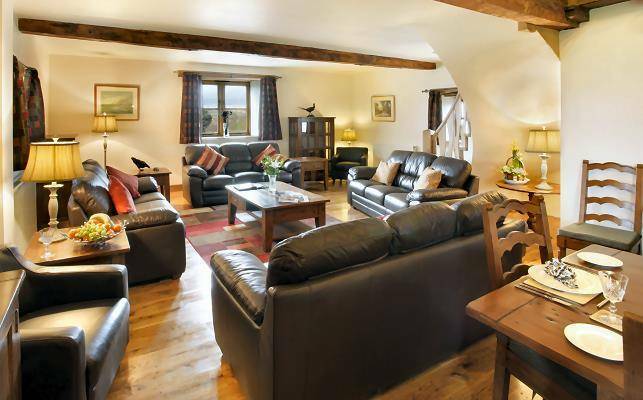 Trevase Granary, a long standing 5 Stars Gold award winner, is a luxury barn conversion providing luxury self-catering holiday cottage accommodation for up to eighteen guests. 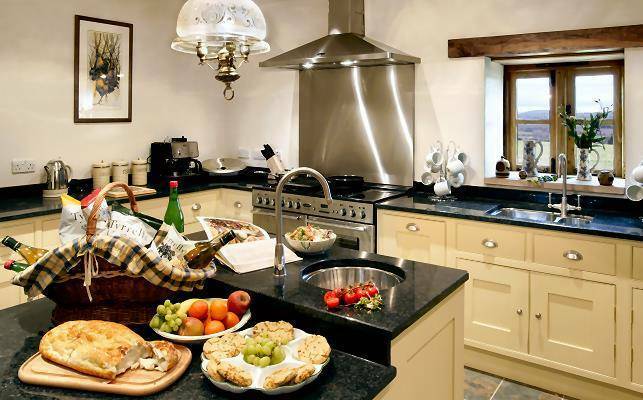 Beautifully located on a working farm in rural Herefordshire, just five miles from Ross-on-Wye, it offers spectacular views of the surrounding countryside. 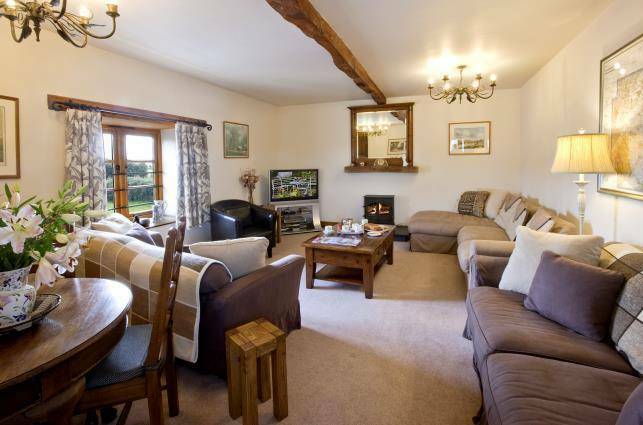 Cottage Garden, Grounds, Fishing and Leisure Facilities. It's not just the internal accommodation at Trevase Granary that is top class - the cottage gardens and grounds are equally impressive. The Walled Garden is secluded, enjoys an open view of the Black Mountains, and is exclusively for the use of our guests. 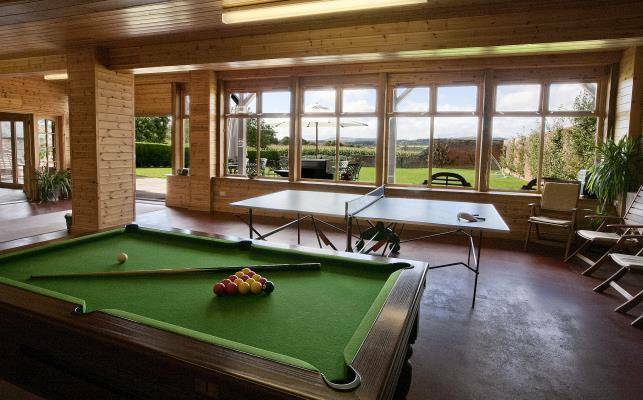 The large, oak-framed Games Room provides table tennis and a pool table to keep our younger guests occupied. There is a kitchen area, with fridge, freezer and dishwasher, and also a changing room with toilet and shower. 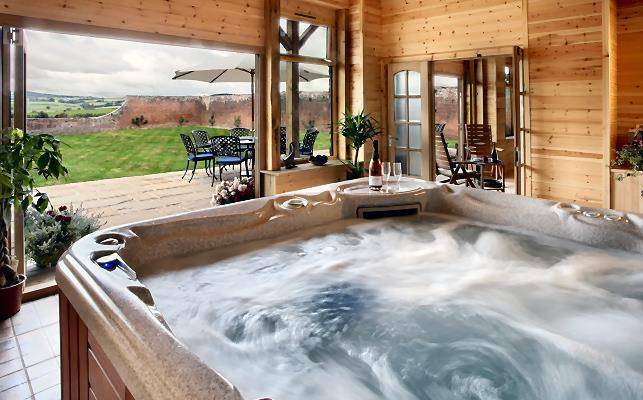 The Jacuzzi is housed in one side of the games room building, with doors that can be locked and fully retractable glass doors leading on to the patio area. It can accommodate up to six adults, and provides an ideal place in which to relax and view the garden and scenery. The Patio is furnished with enough seating for everyone, two large tables, and a suitably large gas barbecue (gas and tools are provided). The Lawn is perfect for football or cricket and has some outdoor toys. Football, football posts, tennis rackets, cricket bat and balls are provided. Cider Family Room is a large, charming family suite with two single wrought iron beds and a very comfortable day-bed that is suitable for children, although many of our hen parties have also utilised the extra bed. The large wet-room makes this suite ideal for a less able guest (some aids are available on request). Coach House Suite is a twin or super-king double bedroom with an en-suite shower room and lovely views. 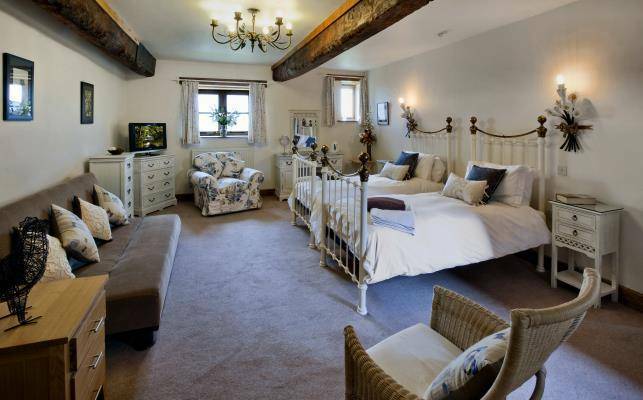 Shippon Suite is a double bedroom with an en-suite shower room and the same outlook as Coach House and Cider. 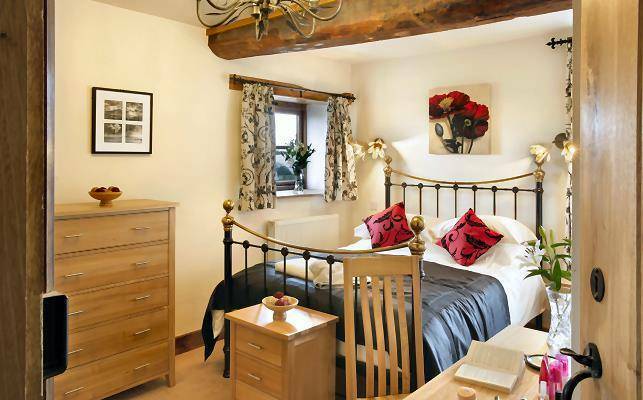 Bull Pen is a double bedroom with a wrought iron bed and a roll-top bath in its en-suite. Dairy Suite is a twin or super-king bedroom with an en-suite wet room suitable for less able guests. The staircase to the first floor is beautifully crafted from oak and fitted with a stairlift. Hayloft Suite is a larger twin or king-size double bedroom with Velux windows to take advantage of the dual aspect, and an en-suite bathroom. Dovecote Suite is reached by an oak circular stair from the Sitting Room. 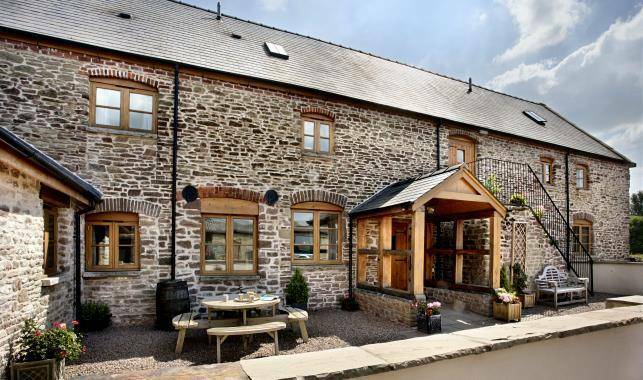 This amazing double bedroom, with views of the Black Mountains and the rolling countryside of south Herefordshire, would make a fabulous honeymoon suite. The en-suite features a roll-top bath.